I know, it is March. Spring time. Time to look ahead to warmer days and flowers and butterflys and the hum of bees amongst the scented honeysuckle. Yeah right. So why is it 1 degree celsius, raining icy cold rain with bits of sleet in it then? So with the fire roaring and wrapped in my fleecy blankets, I finished my new design. Of course, the lack of light means rubbish photos but you can get the gist. And on a teacloth in the polytunnel whilst trying not to crush my seedling coriander! The way the weather is at the moment, I fully expect Christmas to get here before the sun shows its face! This is stitched on 32 count Belfast linen, Flax using DMC threads. This was a really fun stitch but boy, did it make me crave sweet things! Thank you for your emails etc re: the fundraising. It has been a busy few days re: thinking about fund raising. I'm sure you are all aware of the wonderful facebook campaign which has been going on and which has raised so much money for research. So I am going to make the plunge. I'm going to make various things and put them on a seperate page on the blog and when I have enough I will open the 'just give' pages and people can make donations and go into a draw for the prizes. I would love for others to take part, so if you would like to donate a prize, please feel free to send me a photo of the item you would like to donate and I will add it to the prize page. You can either send the item to me direct or once the draw is held, you can send it to the winner yourself. I washed the quilt again and realised I hadn't cut the frayed edge enough..it is now frilled beautifully. It's hard to get it to look as good in a photo as it does in real life but I showed it to some ladies last night and they fell in love with it. I know it's new owner will as well. So I had better work on some fundraising prizes hadn't I! How exciting! I have ideas for crochet, some patchwork ideas and of course some cross stitch. Anything really to take my mind off this miserable, horrible weather! 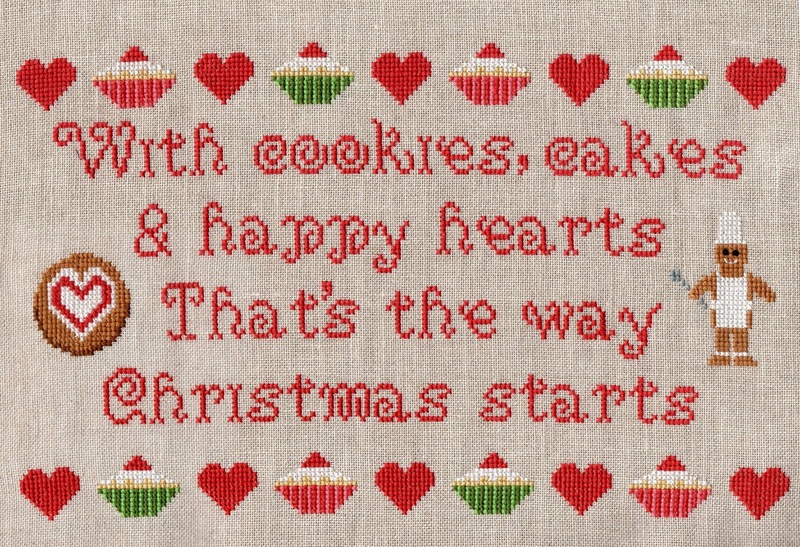 I love your Christmas cookies chart, its marvelous. The colors are great and I can, yes I can...smell Christmas! 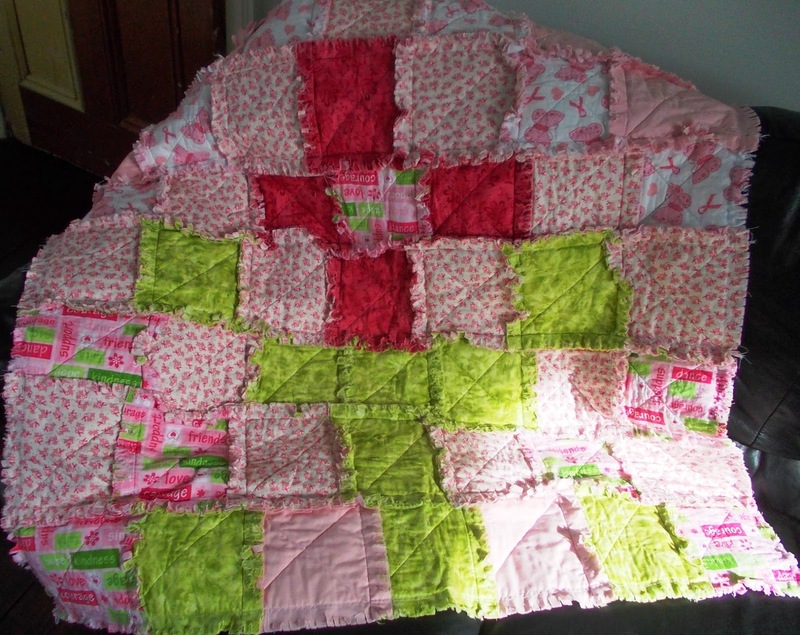 Your quilt is stunning, I love it and your right whom ever it finds its way to they will adore it. Your quilt is looking so lovely..
Good job on the finishes. 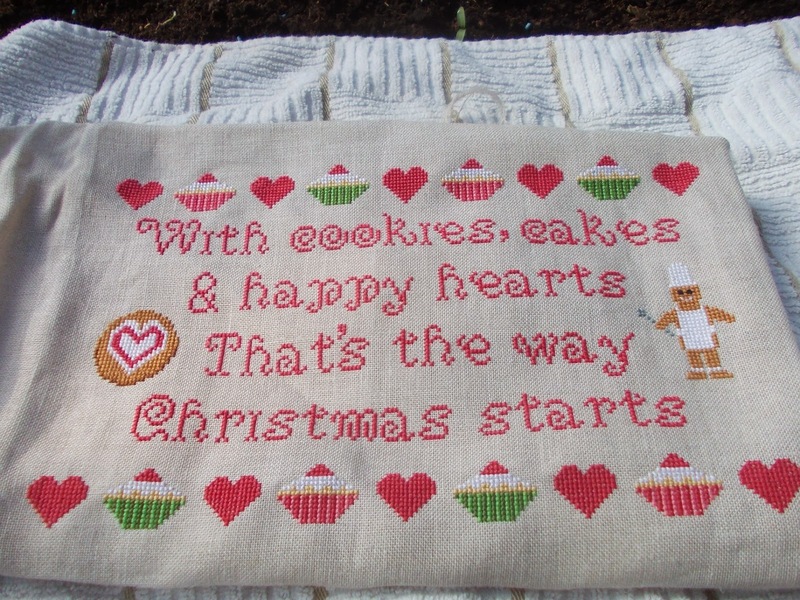 Sweet sentiment for Christmas...it does start with the cookies and cakes doesn't it. LOL The quilt looks wonderfully cozy, it's new owner will love it. Another super design, the quilt is so lush! Stuff the weather, it could be 30°C out there, if I want to stitch a snowman, I'll stitch a snowman!!! :D Love your latest chart, honestly I find they are getting cuter & cuter... All these red colours are just lovely, well done! !